We all know that a hunting knife is essential when you go deer hunting. But what about the part when you need to cut the bone and get the job done fast? Compared to other animals, deer have stronger bones and are very hard to cut if you only use a hunting knife. Hence, you should consider buying a hunting saw instead. Today, we are going to take a look at the top 13 best hunting saws, axes, and machetes. It will help you to get the dirty jobs done with ease. We’ve created a list just for you. Use this as your guide in choosing the right hunting saw for your next adventure in the forest. Most hunters will opt for affordable hunting gears as much as they can. This budget-friendly Gerber Gator Machete’s steel blade features an excellent cutting edge while the other side offers a high-performance serrated saw blade. In that way, you can use this hunting saw in a variety of hunting jobs, not just in cutting bones of big games. Also, this machete features a Gator rubber grip for ergonomic control. The package includes a riveted nylon sheath that provides protection when the sickle is not in use. The blade length is only 18 inches, and its overall length is 25 inches, weighing only one pound. This sleek-looking machete is also from the Gerber Gator. The Gerber Gator Machete Jr. features a two-sided ten-inch high carbon steel blade. The other side is a sharp fine-cut edge while the other side is a rough-cut saw edge. It will allow you to cut or saw anything from thick vines to animal bones. It also features a Machete Jr.’s Gator grip that can absorb shock and will not slip even it’s wet. This machete is perfect to use even in the harshest environmental conditions. It has an overall length of just below 19 inches, making it portable and easy to carry. The package also includes a riveted nylon sheath. Now you can take the Gerber Gator Machete Jr. inside a day pack, clip it on your belt, or stow it away in your vehicle. Whether you’re looking for a machete that can chop woods, help you build a temporary shelter, or be cutting bones of the deer you have captured, this SOGfari machete is the perfect tool for you. This hunting tool is designed to use in a variety of hunting jobs and offers excellent versatility. Rest assured that this machete had been tested and proven to work effectively in the woods. 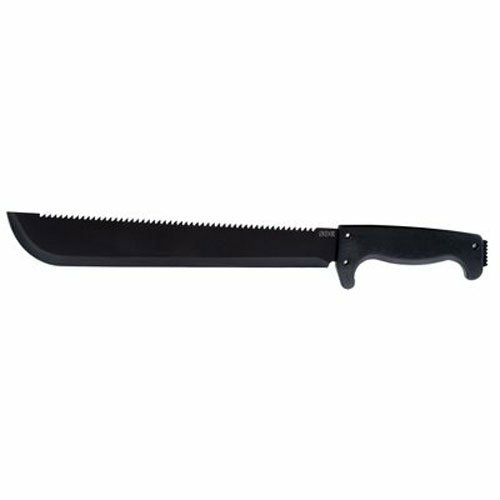 This machete only weighs 13 oz., ensuring optimal comfort while you are using the product. The handle is also comfortable for extended use. The back of the blade features a saw with deep-cutting teeth to get the cutting job done faster. Even the end of the handle features a spiked tang that you can use for scraping and pounding. The handle holes will allow you to mount lanyards if needed. The Camillus Carnivore Z Machete is a multi-function machete that you can use not just in hunting but in farmlands, ranches, and even survival in the forest as well. This product only measures 13 inches, making it easier to bring anywhere you want. 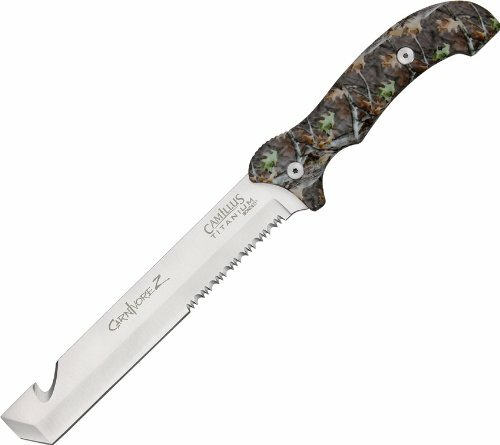 It has a razor-sharp eight-inch full-tang 440 stainless steel and a multi-grind blade that’s ideal for hunting. It also features the Carnivore Z Machete’s cutting-edge innovation that includes a blade-integrated chisel, saw, digging tool, and a wire cutter. The package consists of a ballistic nylon protective sheath that protects the product when not in use. Its premium quality ABS handle can provide years of a comfortable grip. Buyers can enjoy a lifetime manufacturer’s warranty upon purchasing the product. 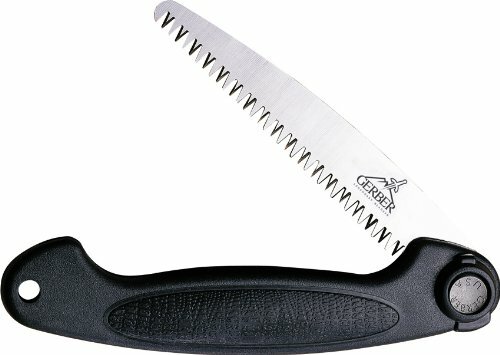 For those who are keen about the durability of their hunting tools, we recommend the Gerber Exchange-A-Blade Sports Saw. It features lock blades that are made of premium quality stainless steel. When not in use, you can fold the blades into a textured non-slip Kraton glass-filled handle. The package includes an exchangeable bone and a wood blade. It also has a nylon sheath that protects the saw when not in use. It also makes it easier for you to bring the saw wherever you want. Weighing only six oz., this blade measures 6.19 inches and its overall length is 14 ½ inches. 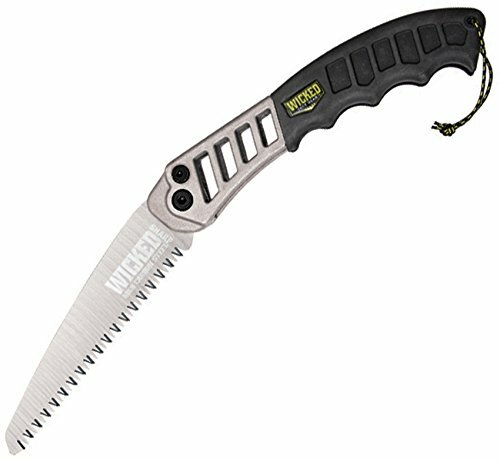 If you want to get rid of thick branches and undergrowth, you might want to check out the Wicked Tough Hand Saw from Wicked Tree Gear. This sturdy hand saw can cut through any trees or woods thanks to its seven-inch impulse-hardened high carbon steel blade. The blade is made of heavy-gauge, 0.50-inch thick steel. Compared to other blades in the market, rest assured that it will not break or bend when used ruggedly. It also has an ergonomic fit in your hands to ensure optimal comfort during the operation. Its non-slip rubber over-molded grip on the saw’s rugged cast aluminum handle will allow you to gain full control of the hunting device while cutting. The manufacturer considers your safety because of its fail-safe blade lock designed with hardened steel lock pain and hardware to safety lock the blade unless you release it. 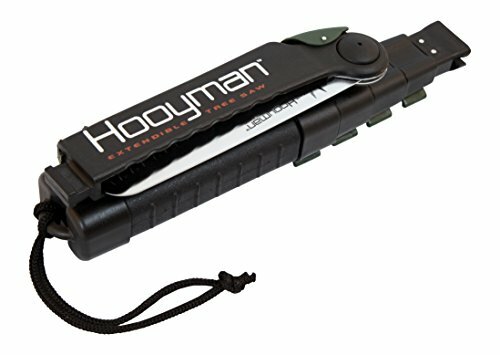 You might want to check out the revolutionary extendible limb-saw design from the Hooyman Extendible Tree Saw. It features a locking, and folding hand saw that you could attach to extension arms. It is constructed using I-beam configured aircraft-grade aluminum that can withstand rugged use for a long time. You can lock each section individually for your safety. Rest assured that this non-flexing tool will not slip out of your hands while you are using the product. The MegaBite blade also features a four-edge tooth design that can cut better compared to other blades available in the market. This 9.7-inch hand saw includes a carrying sling for optimal portability. 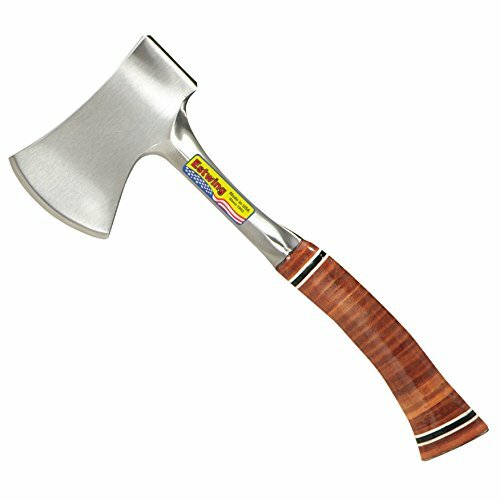 Now, for the ax, we have the rugged Estwing Sportsman’s Axe. For years, it had been used by most huntsmen to survive in the woods and do better in hunting. This uniquely-designed ax in one piece of steel provides superior durability. Compared to traditional axes that are attached to a wood or a polymer handle, it has a stainless steel handle instead. Since there is no attachment hole in the handle, rest assured that the ax head remains thin for superior cutting performance. The steel handle is wrapped with genuine leather washers to ensure a secure grip during the operation. 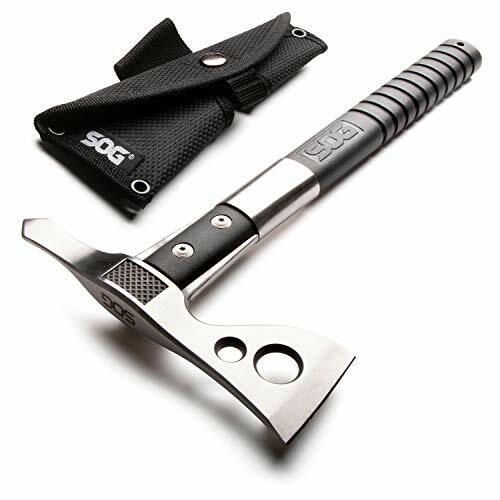 Its overall length is only 14 inches, allowing you to bring the ax wherever you like. 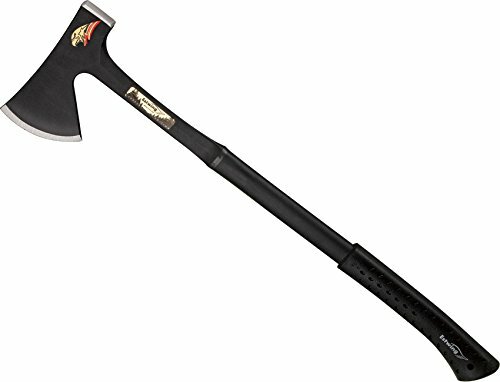 Another product that we’re going to feature from Estwing is the rugged Estwing Long Handle Camper’s Axe. Similar to the previous product, it had been forged from one piece of steel, only it has a more extended handle. Instead of your traditional wood handle, it has a long stainless handle that provides full control during the operation. The ax head is thin to ensure high-performance cutting. Its handle features a Shock Reduction Grip to ensure that it will not slip out of your hands during the operation. It also helps in decreasing your fatigue while using the ax for a prolonged time. The package comes with a nylon sheath. Lastly, we have the sleek-looking versatile SOG Tactical Straight-Edge Tomahawk that features a 420 stainless steel head with a hard-cased black coating. The handle is wrapped with ballistic polymer handle for optimal comfort. This ax is most suitable for digging, hammering, and chipping—both for bones and woods. The package includes a nylon sheath that you can mount in your belt, allowing you to carry the ax anywhere you want. The blade length it only 2.75 inches and its overall length is 15.75 inches.